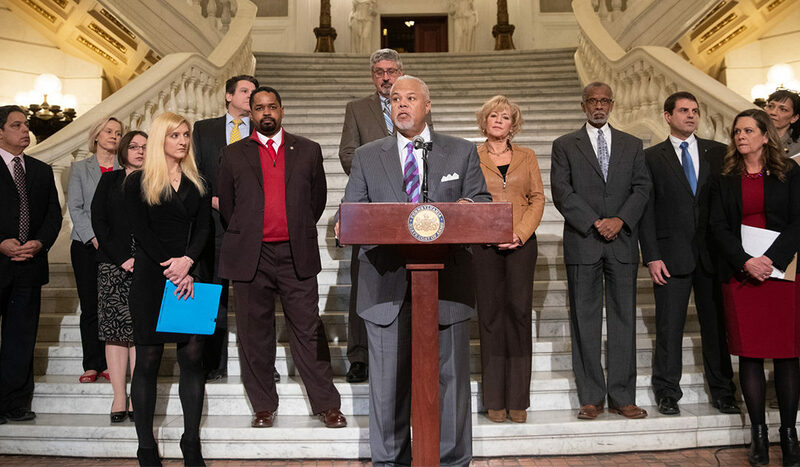 Harrisburg, Pa. − January 28, 2019 − On Monday afternoon, Senators Anthony Williams (D-Philadelphia) and Camera Bartolotta (R-Beaver, Greene and Washington) hosted a press conference to introduce Senate Bill 14, comprehensive probation reform legislation. They were joined by advocates across the aisle and across the political spectrum, including supporters from the conservative think tank Commonwealth Foundation, the ACLU, and Justice Action Network. “It is time Pennsylvania joins the 30 other states that have responsibly put a cap on probation sentences to ensure minor probation violations do not result in new sentences not matching the crime,” said Senator Bartolotta. A number of states across the nation, regardless of rural or urban demographics, have created new frameworks to minimize punishments for technical violations of probation and allow judges to shorten probation time for good behavior. It is time that Pennsylvania join this effort, with consistent terms and fewer punitive conditions for fair probation terms. “Our probation and parole approach is failing. Another solution is required,” said Sen. Haywood. In addition to support from interest groups, the sponsoring Senators were joined by several of their colleagues including Senate Democratic Leader Jay Costa, and Senators Lindsey Williams, Maria Collett, Tim Kearney, Larry Farnese, Sharif Street, and Lisa Boscola.